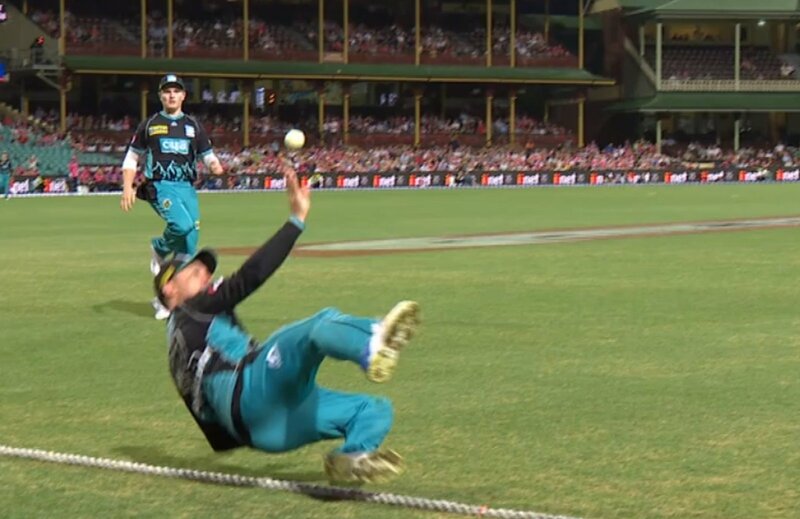 Brendon McCullum defied the laws of physics once again with a sensational fielding effort to avoid the ball from going over the boundary in the ongoing edition of the BBL. The former New Zealand skipper hasn’t shown any signs of slowing down after bidding adieu to international cricket back in 2016. The 37 year old still remains one of the fittest cricketers in the game and showed glimpses of his extraordinary fitness levels in the BBL 2018-19 clash between the Brisbane Heat and the Sydney Sixers at the SCG on Sunday. James Vince, who had scored a superlative half century for the Sixers, went for the big hit down the ground in the penultimate ball of the 17th over bowled by Afghanistan off-spinner Mujeeb Ur Rahman. The ball, despite not being timed to perfection, appeared to be sailing over the boundary for a six when McCullum jumped high in the air and parried the ball in the air realizing that he would not be able to catch the ball inside the ropes. The fielder backing him up picked up the ball and threw it down the wicketkeeper’s end. The third umpire had a good look at it and decided that the 37 year old had done just enough to prevent the ball from going for a boundary. Although he could not complete the catch much to disappointment of the fans and the fielding side, McCullum’s terrific effort on the long-on rope denied the Sydney Sixers a crucial boundary in the final overs of their first innings at the SCG on Sunday evening.